November 2012 Archives - Newman Dignan & Sheerar, Inc. - Providence Fee-Based Financial Advisors November 2012 Archives - Newman Dignan & Sheerar, Inc.
Last week was a good week for equities with major U.S. market indexes posting their best weekly gains in 5 months. The gains were driven by Chinese manufacturing data which was positive in November for the first time in 13 months and strong business sentiment readings in Europe. The DJIA gained 3.3% for the week and the S&P 500 posted a 3.6% weekly gain. This week look for reports on durable goods orders, new home sales and a revision to third quarter GDP numbers. While durable goods and new home sales may be slightly lower in the 3rd quarter, GDP will probably be revised up to 2.8% from the initial reading of 2%. We look for continued volatility in the markets as news of progress or lack thereof on the “fiscal cliff” will continue to drive investor concerns. At this point almost all S&P 500 companies have reported 3rd quarter earnings. At the beginning of October forecasts were looking for a 2% decline but now the quarter may show a minor increase. However, revenues were weaker than expected with 61% of companies reporting revenues less than expected and the first decline since 2009. As a result GDP estimates for the 4th quarter are now 1.8%. Last week was another negative week for the equity markets with the S&P 500 down 1.36%. 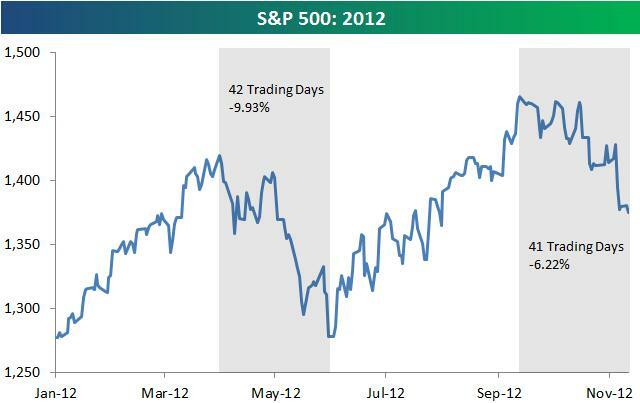 Markets have been in a correction since the S&P 500 hit 1465 in September. However, 5.3% of the decline occurred in the 7 trading days since the election. Below is an interesting chart of the S&P 500 illustrating the similarity of the correction we saw in May to the current market sell-off. Readers of our recent quarterly newsletter were informed of our expectation of such an event occurring. This week last year we wrote about “Giving Thanks” but not for the uncertainties we were facing at the time. Take a quick read and see how little has changed regarding politics and economics yet the S&P 500 is up over 13% since this posting. Markets are in rally mode today as fiscal-cliff fear fades. However, we would not be surprised to see volatility remain elevated until there is more certainty out of Washington. The election is over, and most of the players remain the same. The expectation that President Obama would be a one termer [like Carter] because of the subpar recovery was shattered. It seems that the better Obama comparison is with FDR. The market advanced early in the week as the possibility of a Romney win seemed to increase. That hope was shattered by midnight on Tuesday, setting the stage for a 2.4% weekly market slide. The post-election domestic economic headlines are incessantly chanting “fiscal cliff” [a subject which we first discussed last May 29th]. This cliff is an artificial Armageddon that was created by politicians and will be “solved” by them at the last minute. 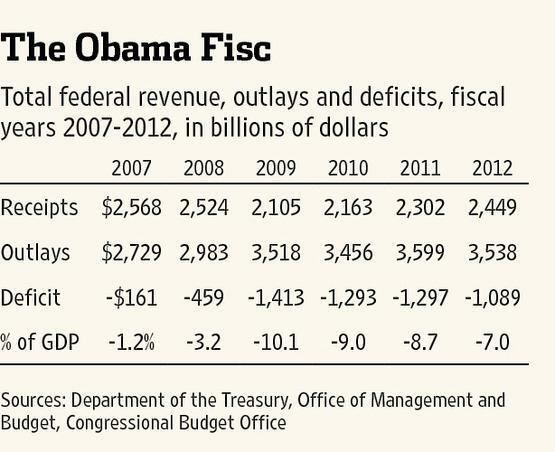 At its core, the debate is about the size of the federal government, as measured by its spending. As the following table shows, tax receipts are within 5% of the prerecession level. However, spending is ~30% higher than 2007 level, and the deficit as a percent of GDP, although declining modestly, is at an unsustainable level. And don’t forget, the accumulated explicit deficit has grown from $11T to $16T in the last four years [now at 100% of our GDP!]. Let’s hope that our Washington leaders come to a resolution that does not kill the goose that has been laying all the” golden eggs” over the last ~236 years. Our thoughts and prayers go out to everyone impacted by the devastating effects of Hurricane Sandy. Sandy was yet another reminder that each day is a gift. Last week was a shortened trading week due to disruptions from Hurricane Sandy. For the week, markets were basically unchanged with The Dow Jones Industrial Average closing at 13,093 (down 0.11% for the week) and the S&P 500 closing at 1,414 (up 0.16% for the week). Despite generally good economic news for the week – better-than-expected consumer confidence and payroll data, strong Chinese purchasing managers’ index, and decent retail sales – investors were in no mood to cheer due to Sandy, the uncertainty of the upcoming elections and the looming fiscal cliff. Good news – The unquenchable human spirit will prevail and people will rebuild and move-on from Sandy, the elections will be over soon (finally … no more political ads), and the fiscal cliff will, hopefully, regain the attention of politicians in Washington. History is fairly clear in that the markets will likely move higher into year-end once the elections are over. We plan to stay the course.